This one is piston not DI, but would the POF Revolution qualify as a small-frame AR? Your missing one small frame ar 10 and that is the adams arms. I tend to think there is some commonality between the manufacturers on the small frame. What it is in agreements or design commonality I do not know. It would be interesting to have a manufacturers rep chime in on this subject. I purposely left out the Adams Arms piston upper for the GII. It's an AR15 chambered in 7.62 NATO. Went over it and inside it in detail with Frank at SHOT. The bolt is AR15-sized made from AerMet alloy to deal with the thin walls. The extractor is much wider and one lug has been removed from the barrel extension in the extractor clock location to accommodate this extractor. Barrel extension diameter is still AR15, as the upper is literally the same as his Revolution AR15 upper, as is the carrier. There are 9 parts that are different between it and his AR15, one of which is the magazine. The lower has the FCG pocket located about .600" to the rear so he could fit a 7.62 NATO magazine well in the AR15 lower without making a longer lower receiver. There were several videos of mag dumps using Wolf steel case .308 ammunition, as well as shooting .308 subsonic. It's an interesting little rifle. I do have concerns about the diameters of the extension, barrel, upper, etc. when a heavy diet of actual 7.62 NATO is run through it, and voiced those concerns. Last edited by bfoosh006; 08-29-17 at 19:16. 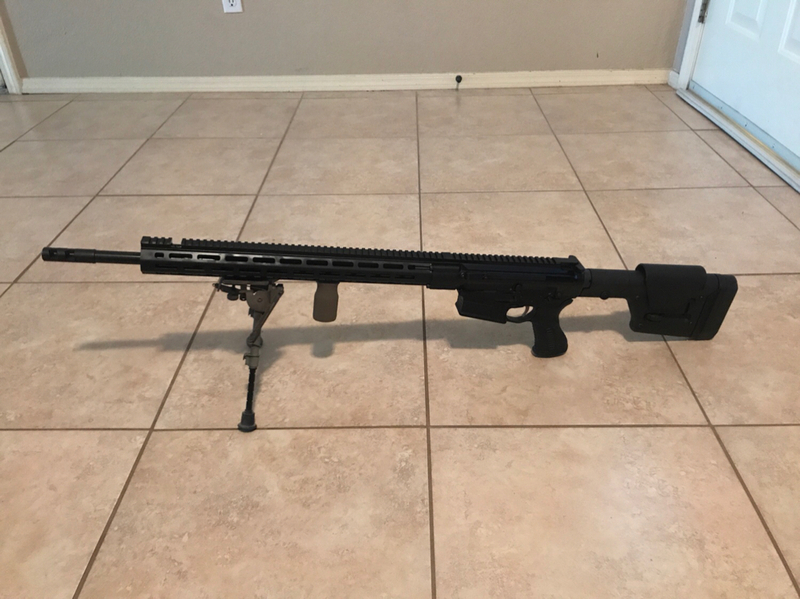 Does anyone have any experience with the Long Range model, specifically the 308, shooting sub-MOA? OR are you aware of any articles that show that? There's some threads on ARFcom showing the 6.5 shooting sub-moa all day. Some published articles assume the LR in 308 will, but no one was actually shooting the gun enough to know. Bottom line is, I want one. I'm hoping it's more accurate than I am. Last edited by ZoneOne; 12-23-17 at 11:52. Well it came in. Waiting on the glass and rings to arrive and then we will see how it goes. All looks good on the gun now. I actually like the trigger from dry firing. Figured I’d report back after putting less than 50 rounds through it. First 20, I didn’t touch the gas and just shot it. It sometimes wouldn’t cycle a new round. I reset the gas, by closing it fully and then opening it up 3 full turns. The remaining rounds all was flawless. My 5shot groups were under MOA. I was able to get a 3 shot group under 1/2 MOA. I’m pleased with the rifle and I really dig the adjustable gas. If you have any specific questions reply here or message me direct. I was looking at one of these in a LGS, and thought I’d revive this thread to see if any more M4C types have shot more than a couple boxes through one. ZoneOne, why’d you sell yours?